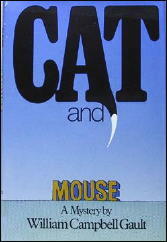 » Reviewed by Allen J. Hubin: WILLIAM CAMPBELL GAULT – Cat and Mouse. Reviewed by Allen J. Hubin: WILLIAM CAMPBELL GAULT – Cat and Mouse. WILLIAM CAMPBELL GAULT – Cat and Mouse. St. Martin’s, hardcover, 1988. No paperback edition. I have not been very enthusiastic about the products of septuagenarian William Campbell Gault’s return to the criminous arena, but Cat and Mouse is more like it. Brock Callahan, retired (owing to a handsome inheritance) private eye, is back again, and this time involved in a case in which I can believe. A dead cat, deposited on Callahan’s front lawn, announces the arrival — and implies the murderous intentions — of the bald man with the scar. Nameless he is, and nameless he stubbornly remains, probably arisen out of one of Brock’s old cases (but which?) and determined on a lingering revenge. How does he remain just out of reach, flitting here and there, leaving the odd body behind, when cops of several cities and all of Brock’s numerous friends and connections are on the lookout? I thought I had copies of all of Gault’s mystery novels, so I was surprised when I checked this evening and found that I don’t have this one. I know why, though. Hardcovers were an expensive proposition for me in the 1980s, and I put off buying this one until the paperback came out. Which it never did, which seems foolish on the part of some publisher (or all of them), for whose PI novels are more suited for paperback consumption than William Campbell Gault’s? I stumbled across this title when I went to take out THE BLOODY BOKHARA at my local branch of the CPL. I flipped through the DJ blurb and the first pages of the first chapter and quite by accidnet came across something else before returning it to the shelf. On the dedication page Gault thanks Bill Pronzini, Marcia Muller and a few others for preventing the book from becoming stillborn (or something like that). Funny that Allen Hubin should write “Nameless he is, and nameless he stubbornly remains…” knowing that Bill had some influence on the book getting finished. An interesting connection, perhaps. I’ll have to ask Al, to see if he remembers!